1. Opalhouse Stoneware Christmas In The City Appetizer Plates - $15 for Four (via Target) Having kids around really makes the Holidays all the more fun. I got these plates which hopefully arrive in time for trimming the tree this Friday night and we can use for treats while they sip Hot Chocolate and we listen to Christmas music. 2. Lands' End Needlepoint Christmas Stocking with FREE Personalization - $30 each current special of $15 (via Lands' End) My mom sent me these in October as she wanted us all to choose some to replace our childhood ones that were lost. I instantly loved how traditional and classic they looked and jumped at the chance to get some for the kids as well. The quality and price are truly unbeatable. 3. 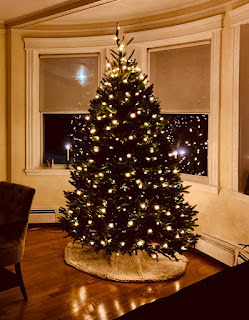 Celestial Lights Window Candle with Timer (dual sided with brighter side for street view) - $15 each (via Amazon) I believe this is a New England tradition which I didn't know about living in the City and I now love! There is something so romantic about the Holidays in New England. UPDATE: The target plates were super cute but not the right plates. They are tiny and more for passed hor d'oeuvres than salad or dessert plates. So back online I went and looked everywhere and finally settled on these whimsical and fun yet not childish plates from Pier 1 which I just unpacked and LOVE, plus, you are in luck as they went on sale since I ordered (4 for $21) and arrive before Christmas! 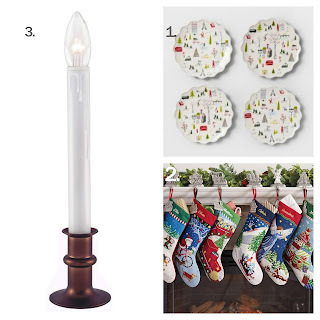 *IRL purchases have been made at Home Goods (tree skirts, ornaments, items for coffee table centerpiece, and wrapping paper) and Home Depot (mantle garland, tree lights and timers). The former being my year round fave!